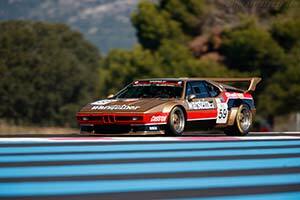 Acquired new by Team Krebs, this M1 was entered in the first two Procar rounds by Albrecht Krebs. It was then entered in Team Warsteiner colours for Jochen Mass in the Procar and DRM series. The best result for Mass was a seventh in the Procar race at the Hockenheimring. In 1981 and 1982, it was raced by Peter Pospieszczyk in several DRM and Interserie rounds. It has since been restored to Warsteiner colours and campaigned by a German enthusiast in historic events.